, a learned divine, first of the church of England, and then of the Romish church, was born at Worsbrough, near Barnsley, in the west riding of Yorkshire, not in 1615, as is said in the Biographia Britannica, but probably in the following year, as he was baptised Sept. 17, 1616. He was educated at University college, Oxford, under the tuition of Abraham Woodhead, who proved afterwards a great champion for the popish cause. Having taken his degree of bachelor of arts in July 1635, he was in August following chosen fellow of his college. In April 1638, he proceeded master of arts, entered into holy orders, and became a noted tutor. During the rebellion, he was one of the standing extraordinary delegates of the university for public business, and one of | the preachers before the court of Charles I. at Oxford. According to Smith, he preached once, probably in his turn, and was requested by his majesty to preach a second time, on which account the convocation granted him his grace for bachelor of divinity, whenever he should think fit to take that degree; but in May 1648 he was ejected from his fellowship by the parliamentary visitors, and then went to the continent, residing principally at Rome, where he is said to have “improved himself in all kinds of polite literature.” He seems also to have confirmed the secret liking he had to the Roman catholic religion, although as yet he thought proper to conceal the circumstances. After the restoration he was reinstated in his fellowship, but went again to Rome as travelling tutor to some young gentlemen. 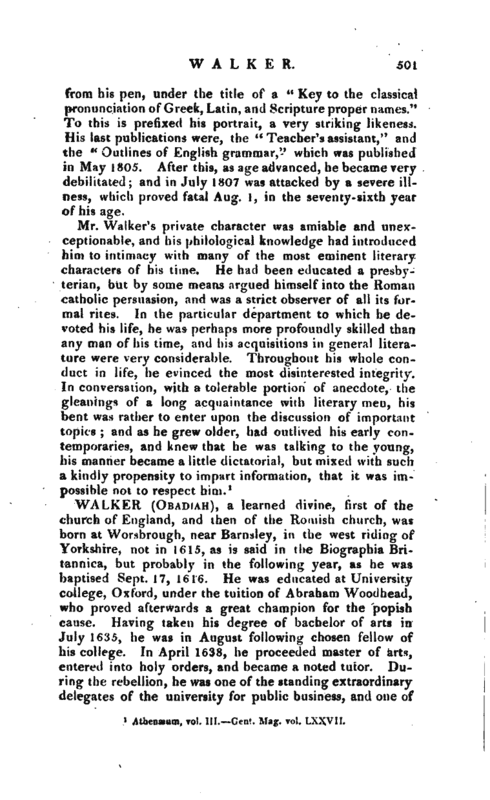 After his return he might have been elected master of his college, on the death of his namesake, but no relation, Dr. Thomas Walker, in 1665. This he declined for the present, but accepted it in 1676, after the death of Dr. Richard Clayton, who had succeeded Dr. Thomas Walker. 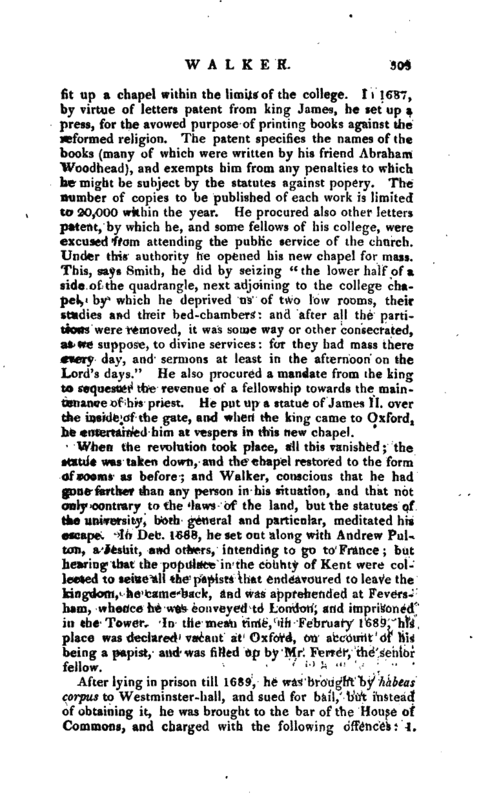 While these repeated offers of the mastership show in what estimation he was held by the college on account of his learning, it seems rather singular that the change in his principles should be either not known, or disregarded, for at this time, we are told, ^he was assistant to his tutor Abraham Woodhead, who kept a popish seminary at Hoxton. 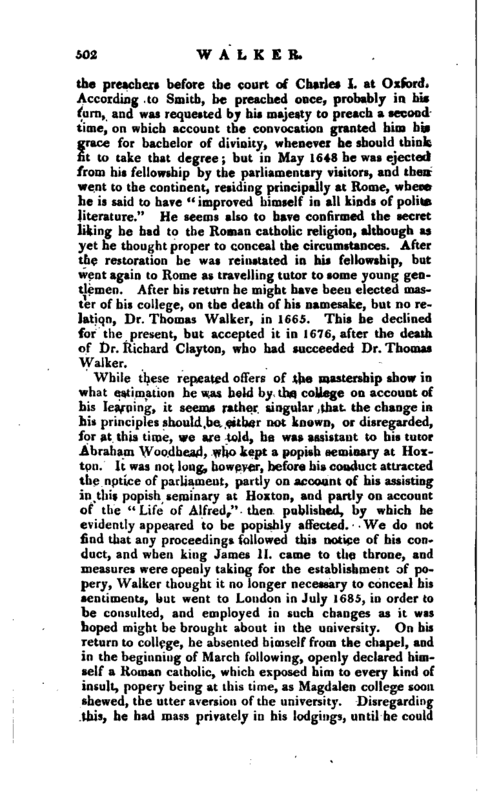 It was not long, however, before his conduct attracted the notice of parliament, partly on account of his assisting in this popish seminary at Hoxton, and partly on account of the “Life of Alfred,” then published, by which he evidently appeared to be popishly affected. We do not find that any proceedings followed this notice of his conduct, and when king James II. came to the throne, and measures were openly taking for the establishment of popery, Walker thought it no longer necessary to conceal his sentiments, but went to London in July 1685, in order to be consulted, and employed in such changes as it was hoped might be brought about in the university. On his return to college, he absented himself from the chapel^and in the beginning of March following, openly declared himself a Roman catholic, which exposed him to every kind of insult, popery being at this time, as ^lagdalen college soon shewed, the utter aversion of the university. Disregarding this, he had mass privately in his lodgings, until he could | fit up a chapel within the limits of the college. Ii 1687, by virtue of letters patent from king James, he set up a press, for the avowed purpose of printing books against die reformed religion. 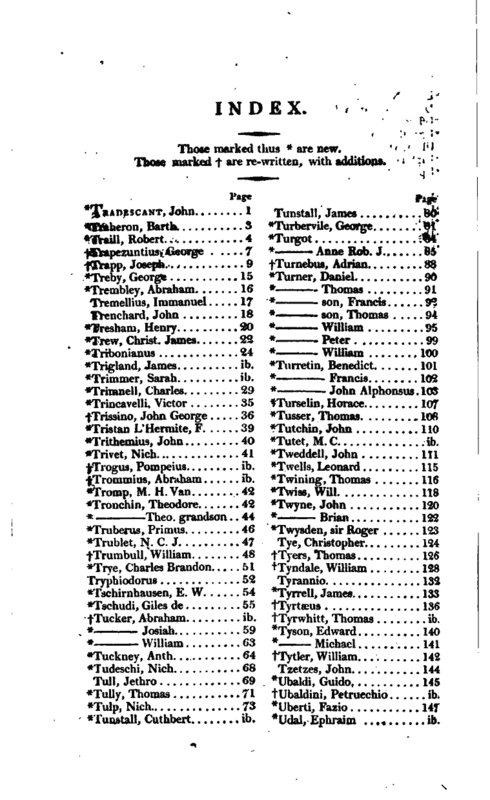 The patent specifies the names of the books (many of which were written by his friend Abraham Woodhead), and exempts him from any penalties to which he might be subject by the statutes against popery. The number of copies to be published of each work is limited to 20,000 within the year. He procured also other letters patent, by which he, and some fellows of his college, were excused from attending the public service of the church. Under this authority he opened his new chapel for mass. 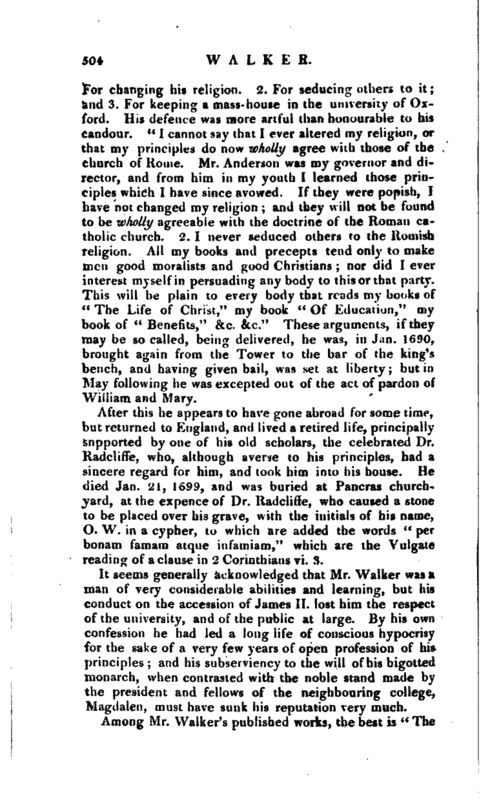 This, says Smith, he did by seizing “the lower half of a side of the quadrangle, next adjoining to the college chapel, by which he deprived us of two low rooms, their studies and their bed-chambers: and after all the partitions were removed, it was some way or other consecrated, as we suppose, to divine services: for they had mass there every day, and sermons at least in the afternoon on the Lord’s days.” He also procured a mandate from rhe king to sequester the revenue of a fellowship towards the maintenance of his priest. He put up a statue of James II. over the inside of the gate, and when the king came to Oxford, he entertained him at vespers in this new chapel. When the revolution took place, all this vanished; the statue was taken down, and the chapel restored to the form of rooms as before; and Walker, conscious that he had gone farther than any person in his situation, and that not only contrary to the laws of the land, but the statutes of the university, both general and particular, meditated his escape. In Dec. 1688, he set out along with Andrew Pulton, a Jesuit, and others, intending to go to France; but hearing that the populace in the county of Kent were collected to seize all the papists that endeavoured to leave the kingdom, he came back, and was apprehended at Feversham, whence he was conveyed to London, and imprisoned in the Tower. In the mean time, in February 1689, his place was declared vacant at Oxford, on account of his being a papist, and was filled op by Mr. Ferrer, the senior fellow. After lying in prison till 1689, he was brought by habeas corpus to Westminster-hall, and sued for bail, but instead of obtaining it, he was brought to the bar of the House of Commons, and charged with the following offences: 1. | For changing his religion. 2. For seducing 1 others to it; and 3. For keeping- a mass-house in the university of Oxford. His defence was more artful than honourable to his candour. “I cannot say that I ever altered my religion, or that my principles do now wholly agree with those of the church of Rome. Mr. Anderson was my governor and director, and from him in my youth I learned those principles which I have since avowed. If they were popish, I have not changed my religion and they will not be found to be wholly agreeable with the doctrine of the Roman catholic church. 2. I never seduced others to the Romish religion. All my books and precepts tend only to make men good moralists and good Christians; nor did I ever interest myself in persuading any body to this or that party. This will be plain to every body that reads my books of” The Life of Christ,“my book” Of Education,* my book of *‘ Benefits,“&c. &c.” These arguments, if they may be so called, being delivered, he was, in Jan. 1690, brought again from the Tower to the bar of the king’s bench, and having given bail, was set at liberty; but in May following he was excepted out of the act of pardon of William and Mary. After this he appears to have gone abroad for some time, but returned to England, and lived a retired life, principally snpported by one of his old scholars, the celebrated Dr. Radclifie, who, although averse to his principles, had a sincere regard for him, and took him into his house. He died Jan. 21, 1699, and was buried at Pancras churchyard, at the expence of Dr. Radcliffe, who caused a stone to be placed over his grave, with the initials of his name, O. W. in a cypher, to which are added the words *’ per bonam famam atque infatniam," which are the Vulgate reading of a clause in 2 Corinthians vi. 3. Biog. Brit. —Ath. Ox. Vol. II. 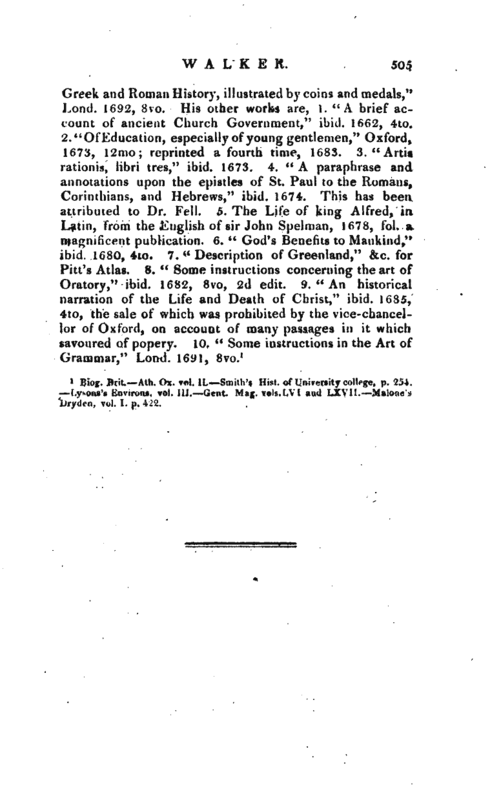 Smith’s Hist, of University college, p. 254. Lysons’s Environs, vol. III. —Gent. Mag. vols. L^l and LXVII. Dryden, vol. I. p. 4?’v. | I N D E X. Those marked thus * are new. Those marked f are re-written, with additions. *Trigland, James. . . . . ib. *Trimmer, Sarah. . . . . ib. J-Trogus, Pompeius. . . . ib. j-Trormnius, Abraham. . . ib. f Tucker, Abraham. . . . ib. *TuastalI, Cuthbert. . . . ib.